Ruco Chan (陳展鵬) and his nominated works are very likely to win at least one award in the upcoming TVB Star Awards Malaysia 2015, which will be held on November 28 in Kuala Lumpur, Malaysia. The actor is not only a favorite to win TV King, his two dramas, Eye In the Sky <天眼> and Captain of Destiny <張保仔>, are both hot favorites to win My Favorite TVB Drama. His coupling with Grace Chan (陳凱琳) in Captain of Destiny is in the running for My Favorite TVB On-Screen Couple as well. The annual awards ceremony, which celebrates popular TVB dramas and artistes in Malaysia, released a mobile app last month to ask Malaysian fans to vote for their favorite stars. Each week, the organizers reveal the top three results from the fan voting, and Ruco Chan has been dominating his nominated categories since week one. According to the top three results of the third week, Ruco Chan, Eye In the Sky’s Kevin Cheng (鄭嘉穎) and Momentary Lapse of Reason’s <收規華> Louis Cheung (張繼聰) are the top three favorites to win My Favorite TVB Actor at this year’s awards ceremony. Limelight Year’s <華麗轉身> Linda Chung (鐘嘉欣) and Ghost of Relativity’s <鬼同你OT> Kristal Tin (田蕊妮) and Nancy Wu (胡定欣) are the top three for My Favorite TVB Actress. Eye In the Sky, Limelight Years, and Captain of Destiny are top favorites to win My Favorite TVB Drama. Eye In the Sky’s theme song “The Truth” <真相> and Captain of Destiny’s theme song “Sailing” <楊帆> are also winning in the My Favorite TVB Theme Song category. “The Truth” has already won My Favorite TVB Theme Song at the StarHub TVB Awards in Singapore, which were held last month. Madam Cutie On Duty’s <師奶MADAM> Mandy Wong (黃智雯), Momentary Lapse of Reason’s Rosina Lam (林夏薇), and Raising the Bar’s <四個女仔三個BAR> Elaine Yiu (姚子羚) are the top three favorites to win My Favorite Supporting Actress. Eye In the Sky’s Tony Hung (洪永城), The Fixer’s <拆局專家> Benjamin Yuen (袁偉豪), and Momentary Lapse of Reason’s Mat Yeung (楊明) are favorites to win My Favorite Supporting Actor. Ruco did a better job acting! He must win this year for sure! Ruco for the win! Malaysia fans jia you!!! Vote hard! Ruco deserves his long overdue recognition! @sojin000 Whole family supporting Ruco ! @isay: I’m from Singapore and has been frantically trying to vote for Ruco since voting began in mid October. But this year’s voting is so damn difficult and everything’s in Chinese. I was able to vote last year but couldn’t vote this year. Do you know if overseas fans can vote? I want to Ruco to win in every category that he’s been nominated, esp Best Actor and Best Drama, Fave Charactor, Fave Couple (even though I don’t quite like Grace) and even Fave Enrichment Program. whether it’s EITS or COD, ruco deserves the Best Actor award. as for tv actress, I like nancy but not in GOR. Why no nomination for ‘Under the Veil’? I greatly enjoyed watch this series. It’s well written and well acted. The pacing of the series is steady and there was no subplot/main plot going off the tangent. It sticks to the series main theme and never go off course. Not many remake series can match up to its original, but, this one does. I can’t say it is better than the original, since they have different tone. There are parts that I prefer the original version but there are also parts that I prefer the remake version. I especially love the improvement they made on the Cheung Jan’s character (played by Bosco in new version and Kwan Chung in old version). The changes to the plot that the scriptwriters made to suit current viewers’ taste/view were also done appropriately. Eliza Shum deserves a spot in the Most Improved Actress Category for her portrayal of Yi Yi and Peony in UTV. @kidd Eliza has already won the Most Improved award before hence she’s not eligible for that category anymore. @kidd I agree, UtV needs some sort of recognition. It’s much better written than CoD IMO. I never seen the first one, so no comparison. I still enjoyed this series. @alien it also depends on the attendance of the artist. I know many supports Ruco but Ruco already received the awards in Singapore so it’s unlikely to get it again. However, he does still stand a chance, but maybe Kevin gets the award this time. And maybe in Hong Kong, ruco will get the award again. This list are my prediction and not my preference. @alien Ruco will win astro. Everyone thought he wouldn’t win Starhub back to back but he did. Tvb awards will be a bit harder since tvb needs to “give face ” esp to anthony, not that Ruco’s acting is lacking compared to him or Wayne. So ruco may very well win astro sort of to appease his fans if you want to put it that way. @isay: Yeah…so proud of Ruco and so proud to be his fan. I actually couldn’t believe he won the Best Actor back-to-back at the Starhub Awards. I was in tears when I heard he won again. No actor has won Best Actor 2 years in a row. I wonder if he’ll win it a 3rd time next year with his new drama “A Fist Within Four Walls”. Hopefully this new drama will be aired sometime in late Sep/early Oct before the Starhub awards so that he can nominated and also as a TVB anniversary drama (like COD). @alien the awards in sg and malaysia means nothing. TVB made those awards ceremony there just to promote tvb. Most important is the tvb anniversary awards. Ruco Chan can never get the awards at least for the next decade. His acting is getting better but still not really likeable and not much fans in hong kong. Wayne lai, anthony acting far more superior in under the veil. Sometimes acting is not everything though. I dont agree that the Starhub and Astro awards mean nothing. The Starhub awards is an award decided by fan votes and is a sign of true recognition from the fans. The fact that Ruco is the only artist to win this back to back is a true testament to his acting ability and his relationship with the fans. If anything, the present TVB awards are meaningless as the fans have no real say on it and it is mainly about backstage politics. Ruco has by far given the best acting performance of the year. I found Wayne Lai’s acting in LOS over the top and Anthony Wong has not been as excellent as i hoped he would be. @lam86 Every award means something. Of cos some awards carry “more weight” than others. TVB awards are getting more and more meaningless ironically as the awards are not always given to those who truly deserve them but rather, they are often dished out by TVB in exchange for certain favours. Looking at the prelim results of Astro, we can see that Wayne and Anthony are behind Ruco in terms of popularity, at least in Malaysia. Outside of HK, not many people think that highly of Wayne or Anthony. In fact, looking at Astro and Starhub results of the past few years, I don’t think Wayne is very popular in Malaysia or Singapore unlike Ruco. @isay @rickypang23 from what I observe, those who attend the award will get the awards.Through, occasionally there will of cause be some exceptional cases… But most of the time,the ones who attended the award ceremony would not go back empty handed. So the winners, will also hugely be based on who is attending. Maybe you are right that Ruco might get the award again, what you said made sense too. @isay I agree. Wayne Lai has not gone any further with his acting since Rosy Business. His popularity has waned quite a lot in HK. Anthony is a different kettle of fish. His acting is beyond anyone in TVB. But having said that, it is not at all fair if TVB award him Best Actor because he has loads and loads of experience with the big screen, and acting on TV is nothing to him. In fact, his acting in LOS is nothing extraordinary for someone who can be considered a superstar. Ruco on the other hand has no such experience but is doing so well in past TVB dramas as compared to anyone else. It will be gross injustice if he doesn’t win. @freedalas: agree with you re Wayne having stagnated after Chai Gow in Rosy Business. There was no breakthrough his acting after that. In fact, alot of HK netizens feel that his TV King win for The Confidante was so forced upon by TVB mgmt. Most feel that his acting in The Confidante wasn’t worthy of TV King. If Ruco is not crowned TV King & Most Popular for his role as 11th prince, it is indeed a great injustice!! This will make me support Ruco even more! @isay @rickypang23 Nope, should be Astro and starhub awards does not weigh much. TVB just made the awards there to promote tvb drama and thats it. It wont increase the winners market value in reality because those actors mainly working in hong kong/china. Only if you win TVB anniversary award then you really proud and increase your market value. Dont compare malaysia voters with the voters in hongkong. Malaysia or even singapore voters just vote for the sake of voting. There are not professional. Ruco so far achieve nothing in the hong kong or china market. He only do well in the tvb drama and thats it. So what if ruco is popular in malaysia or singapore? Any producers or directors offering him to act there or he can earn significantly there? NOPE! And so far Anthony acting is superb compare with ruco. And problem with ruco is he still dun have that likable look compare with kevin cheng, raymond, or roger kwok. As he gets older, he looks better. During his younger age, his looks even more hated to be looked at. Dont get offended,i am just speaking the fact and truth. 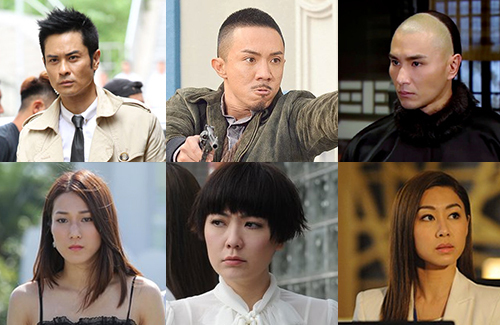 @sojin000 This is my prediction too, except Louis Cheung may creep in for Supporting Actor. Ruco has alot of fans in Malaysia. We are working hard to support Ruco! BY THE WAY! Ruco for sure the WINNER! I am a Ruco fan and recently he has been quite active on IG which is great. Than I was wondering who he will follow on IG, there were the usual stars but what strike me was a name Raachel 928. The profile photo is the back of a girl with a beach view background looking like New Zealand. There is only one follower of this profile and it is private. Which brings me to the gossip linking Linda Chung and ruco. She was Rachel in brothers keeper and her birthday is on a 9th. Cos she has an official IG acc but he never followed her but they are suppose to be good friends. Anyway, I ship them if it real and hope ruco wins lots of awards. Support Ruco Chan all the way!